As a fan of the Philadelphia 76ers it has been a tough decade and a torturous past three seasons. But that has not stopped me from following the NBA and the other teams and talents during that time. During the past ten plus years, I have come to have a serious appreciation for Lebron James. After witnessing what everyone on the planet not from Cleveland thought impossible over the past week, that appreciation is at an all time high. 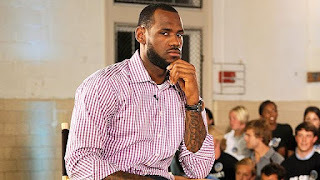 Lebron James is my contemporary, in that he was born within a calendar year of me, and in nothing else. I still remember the first time I saw him play, I was a junior in high school and he was a senior from Akron, Ohio playing a nationally televised game on ESPN. He played against fellow senior Carmelo Anthony and won easily, you could see right then that he was ready for the NBA. That was 13 years ago. I’ve been watching him ever since. During the first seven years in Cleveland he continually made those around him better and carried his team to heights that should not have been possible, unless of course, Lebron James was on the team. In 2007, when I was still in college, there was 22 year old Lebron scoring 29 straight points against a Detroit Pistons team that was in the midst of playing in six consecutive Eastern Conference Finals. James finished that game with 48 points 9 rebounds and 7 assists while guys like Sasha Pavlovic and Drew Gooden played the crunch time minutes for a team Lebron would carry to the Finals. Turned out old Sasha, Larry Hughes, and Big Zydrunas Ilgauskas were no match for an in their prime San Antonio Spurs Big 3 of Tim Duncan, Tony Parker, and Manu Ginobili. The Spurs swept out the upstart Cavs. The rest of Lebron’s first stint in Cleveland was spent much like the 2007 year, trying to will mediocre teammates to championships Lebron could not possibly win on his own. In 2008, the Celtics were a juggernaut and it was going to be tough for anybody to beat a possessed trio of Kevin Garnett, Ray Allen, and Paul Pierce. In the 2009 Eastern Conference Finals Lebron played his most complete series to date and still lost to the Magic in 6 games. In that series, James hit a buzzer beating 3-pointer when down two with two seconds left in game two. He averaged 38-8-8 for the series. He had Mo Williams playing at an All-Star caliber level and kept Delonte West’s head screwed on tight for a whole year. Those are accomplishments maybe Magic Johnson, Larry Bird, or Michael Jordan pull off, not anybody else. Even with all of his individual greatness and clear killer instinct in clutch moments Lebron was always dealing with detractors. 2010 was a good year for the Lebron haters, of which there are many. The season ended with a dejected Lebron ripping off his jersey storming down a tunnel in Boston after the number one seeded Cavs failed to reach the Finals for the third consecutive year despite being clear favorites. That series was the first chink in Lebron’s armor from my perspective. The guy was passive to the point that you could not help but question what he was doing on the court. This was a 6 foot 8 260 pound behemoth that could get to the basket at will, set up teammates, defend, and just overall enforce his will on a game and a series and it was clear that Lebron had checked out during that Boston series. A month later came The Decision. What a travesty that spectacle was. James was a free agent that summer and somebody in his close knit inner circle of mostly his boys from his home town got in his ear that it would be a good idea to do a television show on ESPN to announce where he was going to go. * I watched because that’s just something I was in to, but I did not like how contrived and forced the entire thing was and it really painted James in an off-putting light. Once he accounced he was “taking his talents to South Beach” all hell broke loose in Miami. 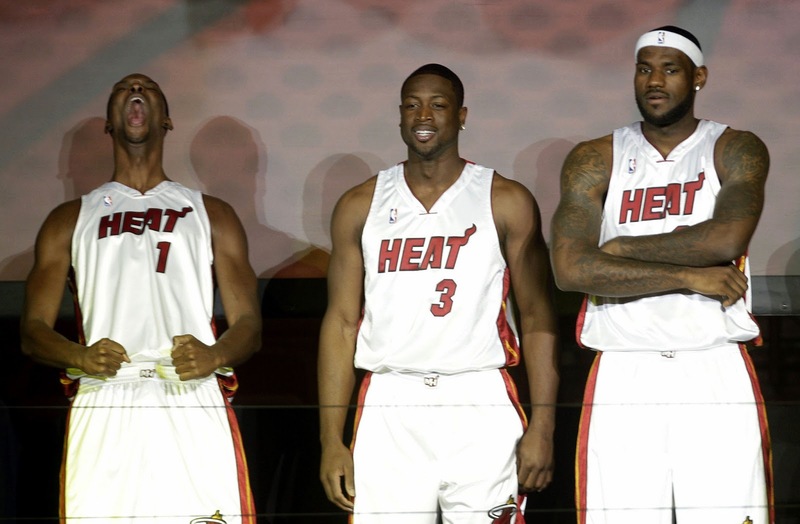 The Heat threw a literally insane welcome party for James and Chris Bosh who also came to join Dwyane Wade in Miami. While talking about the titles they would win Lebron literally started reeling off numbers saying “not 2, not 3, not 4,not 5, not 6, not 7” and Wade announced they were the best trio to play the game of basketball before they even played a game together. The arrogance and ignorance in those statements speaks for itself, but let’s just say it didn’t exactly get Lebron any new fans outside of Miami. And in Cleveland they were burning his jerseys and denouncing the King. The whole teaming up with other superstars thing is not a new concept to the NBA. A lot of the hate coming at Lebron stemmed from his willingness to go play with Wade in Miami to have a better chance to win a championship. Cleveland’s front office was not exactly endearing themselves to Leborn with the cast of has-beens and never-will-bes they saddled him with. I’ll concede that seeking out other superstars via free agency was not something you’d expect Charles Barkley or Karl Malone (shout out John Stockton) to go do, but then those guys never won a title now did they? Michael Jordan had Scottie Pippen for all six and Dennis Rodman for 3 of his titles, both Hall-of-Famers. Magic Johnson played with Kareem Abdul-Jabbar and James Worthy, both Hall-of-Famers. Bird, McHale, Parish – Hall-of-Fame. Kobe and Shaq. Duncan and any list of guys he’s played with from David Robinson to Kawhi Leonard. You don’t win in the NBA without at least two superstars and Lebron went to Miami and came away with two championships. Since The Decision, there has not been an NBA Finals played without Lebron James. Lebron’s time in Miami appeared to be on cruise control as the game came easily to him there. A lot of credit has to go to his coach, Erik Spoelstra, for coming up with ways to maximize what James could do on the court in tandem with two other guys who were used to leading their teams. Lebron’s game was the picture of efficiency in Miami. He developed what we all said he needed to develop during his time in Cleveland, a low post game. If you haven’t been paying attention to the NBA for the past five years or so, you will notice that the game has morphed into a “pace and space” league. The three point shot has become the biggest weapon in the game and the speed to guard these three point shooters has forced teams to play “small ball” where Lebron is generally playing power forward and can use his skill set to do basically anything he wants on a basketball court. With teams going small to match speed with speed James became lethal in the post as a scorer and a facilitator. It didn’t hurt that he was also an all-world defender. Watching the Heat defend the pick and roll in those years was a thing of beauty. The pick and roll has been and always will be the best play in basketball and the Heat were better at defending that with frenetic pace than any one I can recall seeing. The Heat defense formed like Voltron and James was the head. James had shot over 50% from the field once in seven season in Cleveland. He did it all four in Miami and shot an incredible 57% his final two years there. For a guy that does not dunk more than 50% of his field goals that is just an incredible stat. I’m of the opinion that he recognized his true calling as a basketball player in Miami. He’s never had the jump shooting ability of Michael Jordan, but he has the same body as Karl Malone. He belongs on the block where he can play bully ball and wreak havoc on a defense in any number of ways. His four finals appearances in four years in Miami were up and down as you would expect considering he won two and lost two. The loss in 2011 to the Mavericks was puzzling. He once again played passively, similar to his 2010 loss to the Celtics, and Dirk Nowitzki was playing at another level. Regardless of how well Dirk played the Heat should have won that series. Jason Kidd was playing 40 minutes and scoring zero points for that team. That loss was on Lebron for not getting it done. The next year he exercised his demons and put a firm beat down on the upstart Oklahoma City Thunder who were just a bit too young and unseasoned to compete in that Finals. “About damn time,” Lebron said when clutching his MVP trophy. Yeah, it was. It’s hard to say a title was won by luck but the 2013 championship win for the Heat was awfully lucky. The Heat were down 3 with less than 10 seconds to go when Ray Allen hit a series saving three off of a ricocheted loose ball offensive rebound. The Heat still had to take care of business at home in game 7 against the Spurs but one bounce the other way and Lebron only has one title in four chances in Miami. Heat fans were famously pouring out of the arena when Jesus Shuttlesworth sent that game to overtime. Shame on those punk fans. In 2014, the Spurs came back with a vengeance and steam rolled the Heat who looked tired and worse for the wear. James saw the writing on the wall in Miami between Wade’s chronic knee issues and Bosh’s scary health issues and had structured his contract in a way that allowed him to once again test the free agent waters. 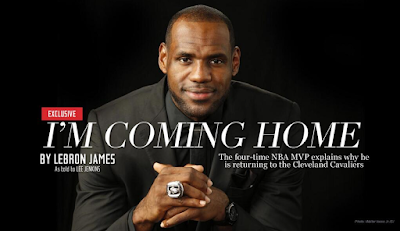 I was standing in line in Chick-Fil-A in the summer of 2014 when texts started pouring in that Lebron announced he was going home to Cleveland. I said to the guy next to me that James was headed back to Cleveland. He already knew. That’s how you know a guy is a superstar. 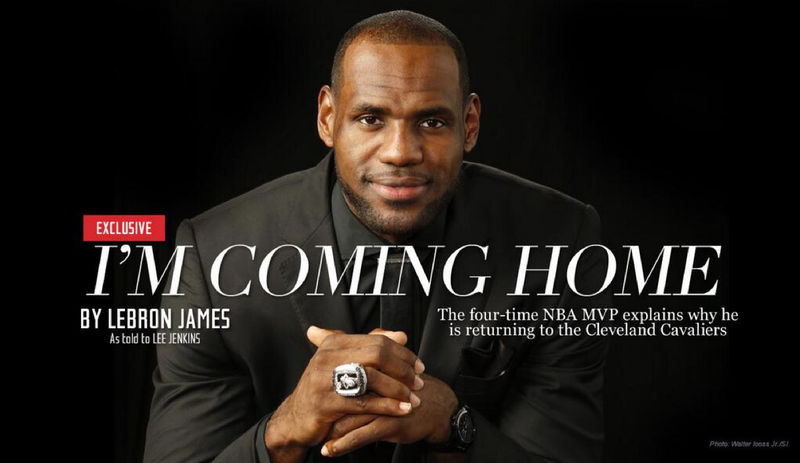 James framed his decision to return home as being for the city of Cleveland and the Northeast Ohio region. I’m sure some of that is true, but if we’re being honest, James real reason to come back home was because it presented him with the best chance to win more championships. When he left, the Cavs obviously fell on hard times and that allowed them to (luckily) acquire two number one picks. Kyrie Irving, from Duke, was a budding superstar point guard on the rise (Lebron had never played with that kind of talent at point guard) and the Cavs had just selected number one overall pick Andrew Wiggins when James said he was coming back. De Facto GM Lebron quickly sent Wiggins out of town in return for Kevin Love. Whether or not that was a good move has been rendered moot. The past two seasons in Cleveland and in particular the past two Finals have all been taken directly from what can be considered the Lebron James playbook. After 40 games last season, the Cavs were 19-21 and had lost 9 of 10. A team that talented clearly had some inner turmoil going on if that was the kind of results they were putting up in the NBA’s LEastern Conference. During that awful run, Lebron, as only Lebron can do, took a sabbatical. A what? A sabbatical. That’s right, James took two weeks (mid season!) to rest and recharge his batteries reportedly in Miami. He came back and the Cavs reeled off 12 straight and 18 out of 20. People were fired up about his absence, but when he came back and led the team to that kind of success it tends to silence the nay-sayers. It was a foregone conclusion the Cavs would make it to the Finals but still up in the air as to who they were going to play. The “shoot the lights out” Golden State Warriors made it through the difficult Western Conference after a stellar season and held home court advantage for what was Lebron’s 5th straight NBA finals appearance. Kevin Love was lost in the first round of the playoffs after he separated his shoulder. After a solid NBA Finals debut in game 1, Kyrie Irving broke his knee cap in the 4th quarter and that left just the chosen one to take on a team that had yet to be stopped all season. With the Cavs down 0-1 in a series where they were woefully over matched, Lebron James cemented his legacy in my mind. The Warriors are a team that can go on a 12-0 run in 46 seconds, they are a team that can switch defensively on almost any screen and not lose a beat, they are a team that has perhaps the best two shooters in NBA history. The Cavs had Lebron and Matthew Dellavedova and Timofy Mozgov. James went to work. In a league where you almost always see pick and rolls, ball movement, and finding the man for the open shot the Cavs shunned all of it. Lebron James was the Cavs offense in a game two overtime victory. On more than half their possessions he would get the ball on the wing and go to work one-on-one against a bevy of different defenders. Andre Iguodala seemed to be the best one to slow him down, but if you consider 39 points 16 rebounds and 11 assists slowing him down then that can be your prerogative. Back in Cleveland in game 3, we saw another genius performance from the only guy on the Cavs who would even start for the Warriors. You could argue that James was the best player in the series and the Warriors had the next best five players. James threw up an insane 40-12-8 line in game 3 and miraculously had his team leading the NBA Finals all by himself. It fell apart for the Cavs from there but if you didn’t walk away from that series thinking Lebron James was the best player on the planet and the best player since Michael Jordan you were kidding yourself or an outright hater. Then came the 2015-16 season and more controversy. Lebron James wasn’t getting along with his second year head coach David Blatt and had him shipped out of town on the first flight to Tel-Aviv (Blatt was a coach in the Israeli League for 15 years). Was it that he wasn’t getting along or just didn’t like Blatt’s coaching style? It does not really matter, the fact is de facto GM Lebron had Blatt sent packing and hand-picked his predecessor in former Allen Iverson nemesis Tyronn Lue. Was Lebron’s primadonna presence submarining the Cavs? Did his recruiting of Kevin Love and his lack of fit in the Cavs system hinder his chances for a title? Did Lebron overvalue Kyrie Irving and his talent? 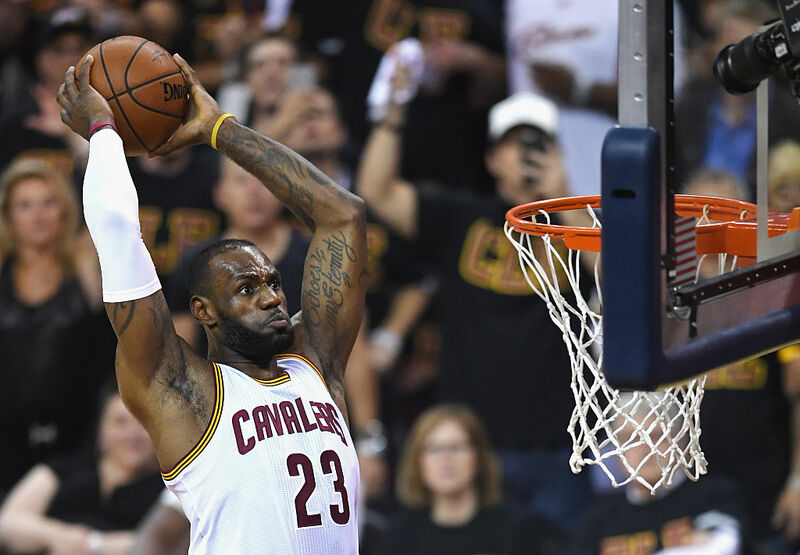 Lebron answered all those questions with a virtuoso performance in the 2016 NBA Finals. Heading to Cleveland after getting spanked in games one and two in a rematch of the 2015 Finals the Cavs were dead in the water. Steph Curry and Klay Thompson hadn’t even played well and the Cavs were blown out of the building and it looked like Lebron’s 7th finals appearance would leave him with a 2-5 record on the game’s biggest stage. Steve Kerr was coaching circles around Tyronn Lue. Kyrie Irving was wilting in the spotlight. JR Smith forgot that he’s allowed to shoot the ball and Kevin Love was concussed. Even James had pedestrian stat totals. After blowing the Warriors out in game 3 the Cavs had a shot to really make it a series and even things up in game 4 in Cleveland. It was not to be. The Warriors never allowed the Cavs to make game 4 a game and with a 3-1 advantage the series was all but over. In fact, 32 teams had gone up 3-1 in an NBA Finals and all 32 teams won the championship. Only two teams had even forced a game 7. The Warriors controversial and outspoken leader Draymond Green messed up in an already over game four though. After a tussle with James, Green fell to the floor and James stepped over him. While James stepped over him Green took a swipe at Lebron’s man area. Classic Draymond Green if you’ve been following him this year. Enough was enough and Green was over the threshold for flagrant fouls and he was suspended for game 5. Game 5 tipped this series on its ear. Back in Oakland, Kyrie Irving got his groove back. 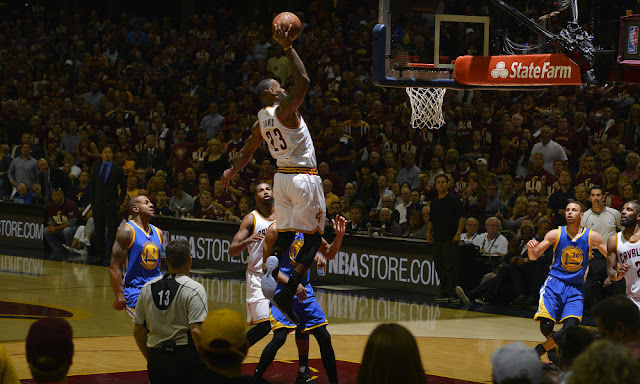 Lebron was not going to be able to do this all himself and thanks to Kyrie he didn’t have to. In game five Kyrie Irving could not miss. In 40 minutes he scored 41 points on 17-24 shooting including 5-7 from 3 point range. Irving’s game is significantly different from what you see for the most part in the NBA today. He has a whole lot of Sidney Deane in him. Irving is a wizard ball handler in traffic and is easily a top 5 finisher and pull up jump shooter in the game. I’d like to get somebody to run a reel of how many times play-by-play announcer Mike Breen said the phrase “Irving, shakes, bakes, gets two” during the last three games of the series. Not to be outdone, Lebron matched Irving’s 41 points and added 16 rebounds, 7 assists, 3 steals, and 3 blocks for good measure. It was the first time in NBA Finals history two teammates went for 40+ in the same game. No big deal. The series would head back to Cleveland where the James gang would have a chance on their home court to force a game 7. Game six was over before it even got started really. 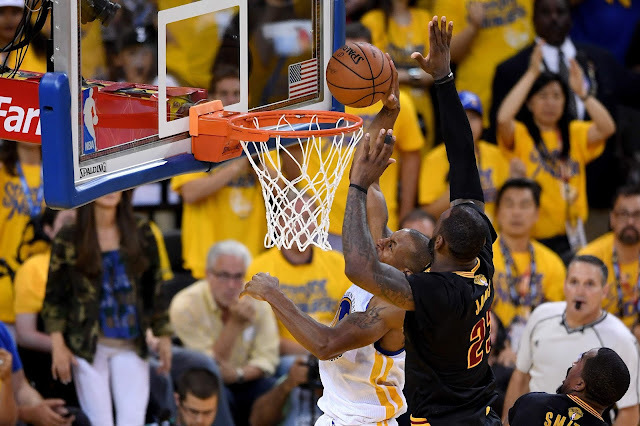 All the Cavs had to do was hold on, and the Warriors didn’t even make them hold on for dear life. James was everything out of the gate and the Cavs were up 20 after the first quarter. After a reluctance to shoot jumpers due to a faltering shot James found something in game 5 and still had it in game 6. James shot 16-27 from the field and toyed with the Warriors in the 4th quarter making Tristan Thompson look like a world beater on impressive assist after impressive assist. Thompson went 6-6 from the field and I have to think James assisted on a minimum of 4 of those buckets, all dunks. Then came game 7. A legacy defining game. A game that could have been considered the biggest game in NBA history, if not in the top 5. It would mean Lebron not getting it done yet again with Warriors winning their second straight title and capping off the greatest season in NBA history, or Lebron officially becoming immortal in the annals of the NBA. So there was little bit riding on this. For years and years Charles Barkley has said that jump shooting teams can’t win championships. Even though the Warriors proved him wrong in 2015, he was right on the mark in 2016 because the best jump shooting team of all time could not buy a three pointer in the second half of the biggest game of their lives. The Warriors clung to a 1 point lead heading to the fourth and the game got knotted at 89 all for what seemed like an eternity. The defense was ratcheded up as high as it could go and nobody was getting clean looks at the basket. It felt like the next bucket could win the game or at least put a stranglehold on who would win. After more than 3 minutes of game time at the same score, Andre Iguodala got out on a break and looked like he’d be coasting in for the go-ahead layup with under two minutes to play. Iguodala was taking off from just past the free throw line and James was still outside the three point line and closing in on the ball like a heat seeking missile. Iguodala got the lay up out and high off the glass. In came James soaring above the rim, his head even with it, as he pinned the ball against the glass an inch before it hit the backboard and it was a play that will live in infamy. I didn’t watch any Bill Russell Finals games but I have to believe that was the best block in NBA history considering the athleticism it took to do it and the magnitude of the situation in which it came . That was a “nobody else on the planet can make that block” block and that’s why you have to have an appreciation for Lebron James. Irving wound up hitting the game winning three, and even Kevin Love played nice defense on Steph Curry in the waning moments, but none of it happens without The King. James finished with a triple double, just the third ever in an NBA Finals Game 7. I’ve written about it before but I’ll say it again. If the Sixers don’t have what it takes, I just want to watch greatness. This Finals was just that. There’s not much left for the detractors to discuss after an all time performance from an all time player and I’m just glad I got to witness it and say I watched James in his prime and there was nobody better. The guy led the entire Finals in points, rebounds, assists, blocks, and steals. Read that sentence again, and then maybe one more time for good measure. There's barely adjectives that exist for a performance like this. Astonishing. He was just locked in. Once he caught fire with Kyrie in game five, whether he said it to his teammates or not, you could see it on his face, he was in no way we’re going to lose this title! mode. * I believe millions of dollars were raised for the Boys and Girls Club of America for that show so it was not all bad.